This member of the chat family is in decline with under 100 breeding pairs in the uk. It is on the red list of Birds of Conservation Concern and is listed as a Schedule 1 species on the wildlife and conservation act and this means it has special protection at all times. They eat insects, spiders, worms, berries and seeds. They measure 14.5cm in length and have a wingspan of 23 to 26cm. 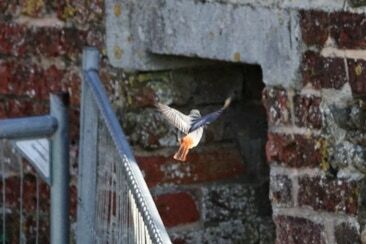 The male is dark grey to black on the upper parts and a black breast and the lower rump and tail are orange/red.